Drawbridges are quaint, but they are so medieval. So when city planners in the industrial town of Gateshead, in northeast England, picked a design for a new pedestrian and bike bridge to connect Gateshead with the historic city of Newcastle across the winding river Tyne, they decided that a break from tradition was in order. For most of the day, a single steel arch vaults high above the water, fixed by 18 harplike suspension cables to a 413-ft.-long, curved pathway below. When a boat approaches, however, the entire bridge pivots to one side. As the lower deck rises into the air, the upper arch descends on the other side until both halves are suspended opposite each other some 90 ft. in the air. 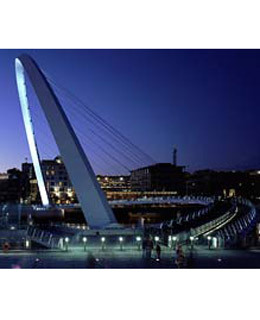 Powered by hydraulics, the $25 million Millennium Bridge can tilt back and forth in four minutes. The bridge is the centerpiece of a multimillion-dollar urban-renewal plan that will eventually connect a new arts center to hotels and restaurants on either shore.